On the 13th of October The Old Vicarage Care Home in Weekly near Kettering, had a visit from the CQC to go through the five key lines of enquiry to see whether the nursing and care services they offer are: Safe, Caring, Effective, Responsive and Well Led. 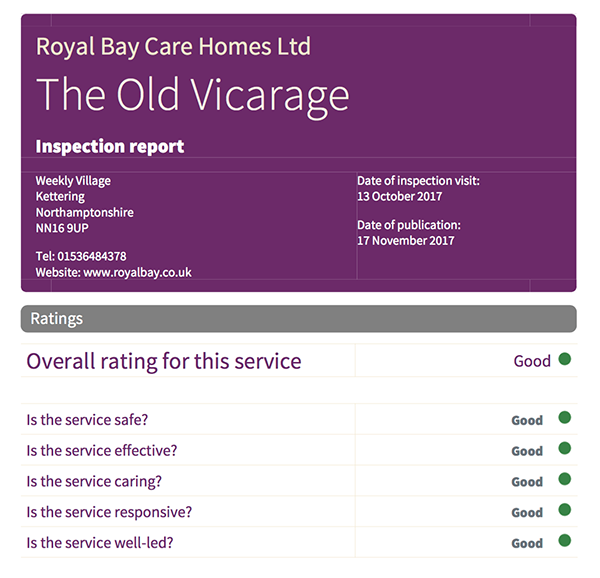 The inspector seemed very pleased during his time here which has been reflected in his report awarding The Old Vicarage Care Home a 'Good' in all areas. Big congratulations to all of the dedicated staff here, led by the Registered Manager Sonya Davies, Deputy Daisy Faustino, as well as their team leaders. As well as being supported by their administrative team and maintenance department. You can view the CQC report if you click here.